In this unit, students will learn about rules for working with polygons. They will start by looking at different types of polygons and what is meant by ‘regular’ and ‘irregular’ polygons. 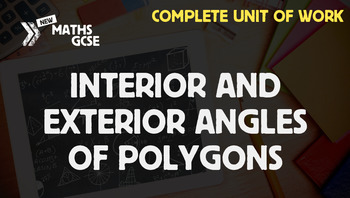 Students will then learn about the sum of exterior and interior angles of polygons, and how to calculate the exterior and interior angles of regular polygons, including learning that interior and exterior angles add up to 180 degrees. Finally students will look at what is meant by congruent and similar shapes.